In the Library at RW Norton Art Foundation: Salvador Dali Prints From Alice’s Adventures in Wonderland. On exhibit Sats & Suns, 1 p.m. - 5 p.m. through 31 August. Originally published in 1865, Lewis Carroll’s Alice’s Adventures in Wonderland already boasted editions with wonderful, iconographic illustrations by both John Tenniel and Arthur Rackham when a publisher had the idea of teaming one of the famous surrealist painters with one of literature’s most surrealistic novels, writes the Norton. In 1969, the Maecenas Press offered a large-scale edition of Alice illustrated by Dali (1904–1989). A native of Spain who spent most of his artistic career in Paris and New York, Dali emerged as a master of surrealism, the natural outgrowth of the Dada movement, in the 1930s. Surrealism emerged from Freud and Jung’s ideas about the subconscious and the significance of dreams. Choosing images that drew from the irrational and imaginary, it became a seminal influence in literature, music, cinema, and philosophy, as well as the fine arts. "“A Hard Day’s Night” is turning 50," notes Alex Kent, "and RFC is celebrating with a special Beatlemania Night on Sat, July 5. The event includes dinner, a trivia contest and a screening of the digitally restored film in our theater. Winners of the trivia contest get tickets to see a Beatles tribute show at The Strand." Begins at 5:30 pm. Tickets $28 ($25, RFC members). 318-459-4122. The illustration is by Enoch Doyle Jeter from the recent book on John Lennon titled She Loves You by Jude Southerland Kessler. Jeter is an artist based in Monroe, La, who has a rocking tavern called Enoch's. He once, it seems long ago, booked celestial music and poetry in Shreveport when he had moved Enoch's to Shrevetown. Look for an exhibit of his Beatles lithography in October at Meadows Museum, Centenary College. A recent Times article in which my remarks were used in conjuring a serious division in the arts community ("When it comes to SRAC, some local artists feel disconnected") and the shortcomings of Shreveport Regional Arts Council was unfair to me and to SRAC. Not on view in the article was my detailed and extensive remarks about the ways in which my artistic growth and the artistic health of Shreveport has been vigorously aided by the sustained work at SRAC. From Artspace to Central Fire Station to Shreveport Common, SRAC has galvanized the arts in Shreveport in the most positive fashion. I wish my remarks saluting SRAC for building a nurturing environment for the arts had been emphasized. My growth as an artist who has been steadily and positively aided by grants and commissions from SRAC was given brief mention. Yet I offered the details of as an example of the positive nature of SRAC's role in the community. Emerging artists and disadvantaged residents in neglected downtown Shreveport are part of the focus of the recent renovation of Central Artspace. In my remarks I honored SRAC for thoughtfully expanding its community scope as well as for expanding its overall services for artists. In regards the artists for whom SRAC is not a fit and those who have enjoyed the benefits of SRAC and moved on to other artistic areas, I was quoted in such a way as to emphasize the separation. In truth, I believe that SRAC serves and engages the vanguard of artists in the region. Truly, I think the group of artists not taking advantage of SRAC's offers of exhibit and grant opportunities is not a numerous group. I am quoted as saying it is a huge community. If I uttered the word "huge," it was a significant mistake on my part. I certainly do not "recognize (a) gulf" between artists and SRAC. In the Shreveport Common urban renovation project SRAC has offered even more opportunities. If this article implied negativity on my part, let me say that I saluted Shreveport Common as among SRAC's many successes. Artists heretofore little engaged with SRAC have been given a wide choice of opportunities to work and be paid to develop events in Shreveport Common. The negative remarks of Debbie Hollis toward SRAC may have been seen by some readers as thoughts with which I agree. That is not at all the case. I lament in the strongest way her vituperation against SRAC and Pam Atchison. My thoughts about SRAC holding back from supporting edgy art was a mistake on my part. By many in the community, SRAC has won points for bravery by presenting major exhibits on graffiti, skateboarding and tattoos, among several shows on issues that can be called provocative. Communication by SRAC, I should have said, is a problem that is being steadily addressed by Atchison and her staff. The recent Food-Art-Film UnScene, a first-of-its-kind event which emphasized local food growers as well as chefs and artists, packed the floor of the Municipal Auditorium. And, in terms of artist communication, two artist gatherings have been held by SRAC to make sure that the connection between UnScene managers and artists was functioning well. The article seemed to shed doubt on whether SRAC capably serves the arts community. That is unfair. And I regret giving my remarks to a reporter whose article seemed to me to strive to cast doubt on SRAC's value. My overwhelmingly positive feeling about SRAC was not to be found in this article. The remarks that I naively offered in terms of balance were highlighted. And, somehow, the sum of the story was negative. Yet, as you can see from my description above, the SRAC story is a Shreveport-at-its-best story. Rehearsal time that would have readied the numerous units in the Wayne White parade was killed by rain on Sat, June 28. The threat of rain to the puppets, made of cardboard and paper, was also a factor in canceling the event, said a member of the production team. White and a team of resident artists and volunteers were ready to roll, said Melissa Orzolek . The rain-based re-set for the shindig is Sat, July 12. "Parade through Shreveport Common with Wayne White and his UNexpected cadre of huge Puppet Characters," said Pam Atchison. "Meet Elvis, Hank Williams, Cora M. Allen, Annie McCune, the Cajun Alligator, and many more UNbelievable Puppet People. Join the Parade of Dancers, Drummers, Stilt walkers, Bands, and Food Trucks. March through the Shipping Container Galleries!" Also see cold adult beverages and comestibles. 6 pm - 7:30pm, see the Artist Shipping Containers,featuring Robert Trudeau, Nicola & Qean Ballard and Jeormie Journell. Also on Texas Ave: Emily Daye's Racing Hearts Installation, E.E.M. United's performance, creating your own mask for the parade with area artists and participation in chalk art. 7:30pm - 9 pm, join in the parade. It ends at Oakland Cemetery where you can view video works by Wayne White on the Drive-In Movie Screen. Shreveport Little Theater Academy's production of A Little Princess has a 3-performance run: Fri, June 27, 6:30 pm and Sat, June 28, at 11 am and 3 pm. Says actress London Todd of the character she's playing: "I love Sara Crewe's compassion. I feel like I can relate to her character as love and kindness are the two most important qualities one can possess." Of her director, Laura Beeman Nugent, Todd says, "She does a wonderful job of helping us thoroughly study the script to find all the minor details which helps us better understand our characters." And, of the music,: " Andrew Lippa's score is very beautiful but challenging, and Mr. Adam Philley has done a wonderful job teaching us. He has individually worked with each cast member to help us create a musical experience that perfectly expresses the emotions of this beloved classic." Andy's Auto Tint has recently moved into a historic building in Highland, says Wes Merriott. "This building has a rich history and we've tried to maintain it's vintage appeal. According to its most recent owners, our building was built sometime in the late 1890's to shoe horses and do general blacksmithing. In the years that followed, it was Shreveport's first Cadillac dealership, the first gas station outside of "downtown" Shreveport, the first Office of Motor Vehicles in the area, an automotive service station and parts house, then slipped into vacancy for the last 20 years. We faithfully restored her to a retro, 60's-era auto garage, and we want to let people know about the new life being breathed into this building in Highland." Wes and partner Andy Ezell recently entered the Louisiana StartUp Prize. "We learned that there are tons of great entrepreneurs in our area with some very exciting ideas. From environmentally-friendly concrete to video game designers and food critics, there's a good bit of brilliance in our area, just waiting to make it big and change the world. We met some really cool dudes who are doing great things in a wide gamut of fields. Secondly, we were encouraged that our marketing plan was well-developed, and prompted us to more fully engage our social media partners. You'll start seeing more blog posts, tweets, and facebook specials from us in the future. Lastly, we learned that we have a real shot at the LA Start Up Prize "FINAL FINAL" event with a change to win $50,000 and direct links to investors. As one of the few entrants with an operating business and existing revenue stream, we've already proven our plan works, and we have a scale-able plan to grow into the future. We are super stoked to see what the next month's qualifier has in store for us," adds Merriott. The witty, fun-loving and acerbic Taffie Garsee vaulted ahead in her art career by being named best of show by eminent art historian Susan Larsen in a SRAC show called Critical Mass II. Her solo show will be on view June 26 - July 26. The Garsee party is Th, Jun 26, at 5:30 pm at Artspace Shreveport, 710 Texas St.
"In 'Dystopian Garden' I am using my artwork to convey scenarios in our human existence, from the perspective of something smaller, to prompt the viewer to take away the nature of a situation rather than the politics of it," says the artist. No cover. Cash bar. Snacks. "RFC will be showing the classic film Say Anything, followed by a documentary about a group of 13 year old Swedish punk rockers called We Are the Best! from June 20 to 26," says Madeleine White. "Two films, a cool couple of stories, for just $12." Wayne White, whose wit-infused paintings are priced at $10,000 and above, will present his artist talk at Artspace Shreveport on Wed, June 25, 7 pm, says Casey Jones. The artist, in residency through his Sat, June 28, 6 pm, puppet parade in Shreveport Common, will also talk to artists. That session will be in Central Artstation on Mon, June 30, 5:30 pm. "Wayne White will answer questions about how local artists can move artwork forward to the regional/national arena," says Vickie Marshall of the Shreveport Regional Arts Council Roster Artists meeting on Mon, June 30, at Central Artstation. "All artists are welcome to join the Roster Artists’ meetings," she adds. Petite teen London Todd has the lead role in the SLTA production of A Little Princess. Having seen her in the recent Centenary College production of In a Bog O Cats, and having watched her play piano for a production of South Pacific at Caddo Magnet HS, I can testify that she is a rising star. Happily, Todd is surrounded by capable players in Princess. Be aware that it is scheduled for a 3-performance run: Fri, June 27, 6:30 pm and Sat, June 28, at 11 am and 3 pm. All tickets $10. 318-424-4439. The cast: London Todd, Lauren Lindsey, Camillle Schmoutz, Chris Schmoutz, Allison Hannon, Cassidy Giddens, Gabriella Henry, Lacie Johnson, Leslie Johnson, Audrey Beeman, Celeste Malmay, Breyanna Flowers, Aubrey Buckner, Owen Osbourne, Rick Bills, Jenna McCann, Theresa Johnson, Xander Bills, Madison Kavanaugh, Cora Simpson, Georgia Johnson, Hailey Hawkins, Georgette Berne, Madeline Collier. "People are doing fun things with 20-foot shipping containers all over the globe," says Brandon Oldenburg, creative director of a series of events in Shreveport Common called UnScene. "We wanted to supply the same kind of canvas for our local artists. I love seeing the diversity in creative vision for these things." The industrial containers, the sort that are stacked 15 high on globe-girdling container ships, arrived at 837 Texas Ave in time for UnScene Makers fair. The first residents included artist Su Stella, whose display included a black light rear Voodoo room. Also a pioneer was Emily Daye, whose unified vision melded clouds and blue sky canvas wall paper with a series of student desks - each containing pencils, paper, etc, in the drawers. "This classroom scene came to me in a dream," she said with a convincing smile. Kids and adults participated in her display by making sketches and writing notes in the 20' classroom. Amanda Rowe, a Natchitoches-based painter and sculptor, created a startling scene of death masks integrated into ominous clouds above a cracked-egg humanoid surrounded by gilded guns and ammo. It was "Humpty in the dumps. Falling off a wall and spilling golden violence," she noted. 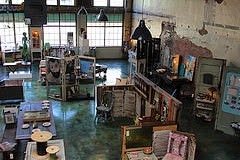 This month Nicola Medley Ballard is creating an art lounge; she's using wooden shipping pallets. "It's a pallet patio for our party," she said. Painter Jeormie Journell is calling his Animal Art Trap. He has of late produced detailed and realistic paintings of rats, a rooster and an opossum. Journell will be selling T shirts that cannily evoke the basic rat trap logo. The trap company he has created is called Ratchet City. Robert Trudeau will be manning a show called Swanky Shreveport. It will be filled with "affordable prints of my pen and ink sketches, matted or framed and ready to go." The newest container artists' debut date is 5 pm on Fri, June 20. That's the night that UnScene will mount a feast ($35 ticket) called Rich Table in the nearby Municipal Auditorium. Expect the galleries to be open again on Sat, June 28, 5 pm or earlier; that's the day of the Wayne White Mega Puppet Parade in Shreveport Common. Shreveport regional Arts Council, sponsors of the containers, want the artists to open the steel boxes as often as possible. Artists are encouraged to produce parties and special events of any unexpected sort, since they are part of UnScene, an attempt by Srac to bring fresh, art-fueled life to Texas Ave.
"Shreveport Farmers Market will be closed Saturday, June 21, due to Festival Plaza's long-standing agreement to host the Good Times Festival," says Noma Fowler-Sandlin. "Please enjoy Homegrown at Provenance that day. We hope to see you again on the 28th of June, when we'll resume our regular schedule. Sorry for the inconvenience." "We're very excited to hold Homegrown: A Local Farmer's Market again at Provenance Community this Saturday," says Sarah Lowder. "Call 318-683-0399 for directions, if needed." Let the Good Times Roll Festival, a celebration of African American culture, will be held June 20-22 in Shreveport’s Festival Plaza, says RhoOmega.com. - two stages of around-the-clock live entertainment. - food vendors, art exhibits. - Southern soul singer T.K. Soul, Friday, June 20, 10:45 p.m.
- New Orleans Bounce legend DJ Jubilee, Sunday, June 22, 7:15 p.m.
- Windstorm, Alter Ego, Howlin’ Henry Robinson. - $10; but $5 on Friday, June 20, until 6 p.m.
- Free for children ages 5 and under. - Photo by Chris Jay for Shreveport-Bossier Convention and Tourism. National Dump the Pump Day encourages people to ride public transportation (instead of driving) and save money, says the American Public Transportation Association in partnership with the Sierra Club. Riding public transit is frugality personified. The latest APTA Transit Savings Report shows that a two person household that downsizes to one car can save – on the average – more than $10,174 a year. Additionally, investment in use of public transit is an overall positive for a community. “The data are clear: one of the strongest tools to create a vital and productive national economy and build strong communities is investment in public transportation,” said APTA President and CEO Michael Melaniphy. Puppet heads are popping up daily at the Central Artstation workshop of eminent artist Wayne White and his Pinocchio team. A new date for the parade in which the puppets will star has been chosen: it is Sat, June 28, according to White. 6 pm is the starting time for the UnScene Shreveport Common bang-a-rang event. Festivities will go on til 9 pm. Photos from the puppet workshop. The choreopoem For Colored Girls who have considered suicide when the rainbow is Enuf is a production of mahoganyensembletheatre.org. Directed by Angelique Feaster Evans. Cast: Sharon Penson, Mary Russell, Dorothea Townsel, Neverlyn Townsel, Tianna Williams, Tanya Williams. Choreography: Roshanda Spears. Also, see projectvoice.org. The Rich Table UnScene on Fri, June 20, at Municipal Auditorium, will feature these chefs, foods and artist accompanists, says Shreveport Regional Arts Council's Pam Atchison. - Chef Evan Rich, Chef Sarah Rich and Chef Jason Brady: Pork Panzanella. SRAC Production Team, Mitch Landry, designer. - Chef Eddie Mars, Petroleum Club: Pork Cheek Banh Mi. Kathryn Usher. - Chef Jason Reynolds: Zocolo's Chilled Field Pea Salad. Emily Day. - Chef Kevin Bourg, Wine Country: Chilled Cucumber Soup. Nadine Charity. - Chef Carolyn Manning, BLUE: Goats Milk Grits. Wendell Wilson. - Guiseppe Brucia, Guiseppe's: Cheese Ravioli. Lynn Laird. - Chefs Scott Roebuck and Liz Bowen, Sevendipity: Local Veggie Slider. Su Stella. - Chef Pansou, Soumas Heritage Creole Creations, represented by Elva Taylor and Ryan Taylor: Creole Maque choux. Panderina Soumas. - Chef Hardette Harris, Chef Services Inc: Green Garden Salad. Panderina Soumas. - Chef Andrew Parsons: Fig Jam & Pork Liver Pate’. Amanda Thurmon. - Chef Conrad Patterson: Pecan Pie. Kathryn Day. - Bakers Lisa and TK Tike, Lilah’s Bakery: Tres Leches Cake. Robert Trudeau. - Tina Palmisano , Jesters Catering: Fresh Vegetable Tamales. Su Stella. - Chef Cedric Williams, artspace: Chicken Meatball. Jeormie Journell. - Chef Charlie Reed, Superior's Steakhouse. Chris Broussard. Chef Tootie Morrison, Abby Singers Bistro. Kirstie Gilliam, Special Events Director. Inasmuch as blueberries, raspberries and strawberries grown in the region will top the Torta des Tres Leches being served by Lilah's Bakery, I can tell you that the list above does not tell the whole story of the deliciousness of the offerings. And in regards the art: a display on the Hank Williams/Jack White stage of the Municipal will offer a work for sale by each featured artist. - 5 pm, welcome and cash bar. Mingling in the lobby around a fresh foods display created by Jim Hayes. Complimentary trolley tours of Shreveport Common, including the musical shacks in the Calanthean Canyon and the Texas Ave Steel Shipping Containers, featuring artists Nicola and Qean Ballard, Jeormie Journell and Robert Trudeau. - 7 pm supper. Tickets online, $35. Where in the warmish Amazon Basin is Manaus, one of the sites of the World Cup? Check out Manaus. There are 12 Brazilian cities hosting World Cup matches. Farm to table events and special moments such as a pig carving. Details at unsceneshreveport.com. Starting July 14 the collection of bulk items such as tree limbs, furniture, appliances and tires will be done by appointment only, says the City of Shreveport. Single-family back door collections for a fee will be discontinued. - Residential customers must call (318) 673-6300 to schedule an appointment for bulk items to be picked up. - All solid waste collected at the curbside must be in containers, except trash collected as part of the bulk program. - There will be no collection from new residential developments with private driveways with inadequate access for solid waste trucks. - There will be no collection of solid waste on vacant lots or unoccupied residences unless the property owner arranges for trash pickup. - The maximum number of dark green trash carts per residence or commercial establishment is two. - As adopted by the City Council in April. - No additional fee is associated with the changes. Art camp 2014! Holli Hennessy and Shirlene Alexander, art teachers at Caddo Magnet High, will be having Art Camp for the 12th year on July 7-11. It is for students 7- 14 years old, says Hennessy, and it will be at the La State Museum. 9 am till 3. Painting drawing printmaking sculpture-- lots of art and fun!! Call me; 573 0063. $200. Supplies included. But not lunch. Shreveport’s summertime Open-Air Market continues through August 8th; it's every Friday evening for 10 weeks, says Julia Foley. Mall St. Vincent will host the South Highlands Summer Market from 5 to 9 pm under a large tent outside the mall adjacent to the historic St. Vincent Academy. - family and pet friendly market will feature 20+ vendors from our region. - locally grown fresh produce, handmade food products, and specialty artisan craft items. - seating area with tables and chairs; shoppers may grab a bite from vendors or a food truck and listen to local musicians. - different vendors will be showcased each week. "Dirtfoot is coming to Bears and bringing our good friends The Mike Dillon Band to show you guys what a real crazy rock show looks like! Guaranteed these guys - "punk funk with vibraphone and trombone" - will make you tear your hair out in fits for joy and madness," says J Bratlie. Dirtfoot has 3 new members, including Garrett Brolund on bass, Sam Apperson on lead guitar and Derek Russell on drums. Founding members Scott Gerardy on saxophone, Jason Bratlie on banjo, and Matt Hazelton on lead vocals and rhythm guitar are the staunch. "Seriously, you don't want to miss this show," adds Bratlie. The Mike Dillon Band opens at 10 pm. Dirtfoot photo Trudeau, 2008, edge of the Red River. "Mr. Lane Bayliss on drums and myself on guitar," says guitarnachist Mark Griffith, "will be improvising as a duo at Bear's On Fairfield this Saturday, June 14, 2014, at 10pm - 'til. Please join us if you dare..."
Admission is $10 and advance ticket purchase is recommended. There will be musical interludes throughout the evening. Snacks at intermission. Cash bar. In his artist talk this week, SRAC artist in residence Wayne White, a rock star in the hyped world of the national art scene by virtue of his numerous projects, invited the community to visit and volunteer (groups by advance notice only at 318-673-6500) as he and his team build mega puppets for his Shreveport Common art parade, the UnScene event on Sat, July 12, 10:30 am. Artists chosen as the residency team for the White project are painter-photographer Rachul McClintic, sculptor James Marks and musician-multi-media artist John Martin. Interning is student Jack Joyce. See snaps of the team at work. Naked Bean Cafe's near the corner of Kings and Highland. Ample parking. Next door to Day Old Blues Records. Rich Table, curated by Sarah and Evan Rich of San Francisco, will be the foodie's UnScene. It takes place in the Municipal Auditorium on Fri, June 20. The localvore cooking from more than a dozen chefs celebrates the Shreveport Farmers Market as well as the farms and gardens being developed in NW La. . At $35 a ticket the feast - with entertainment and art galore - is a bargain. Drinks and a trolley tour at 5, artful, fresh supper at 7. Btw, expect valet parking at the Municipal. Tickets and additional events, such as Farmer's Market Cooking Challenge (June 14) and How to Carve a Whole Pig with Chef Evan Rich (June 18). "Singer/songwriter Willis Alan Ramsey is a cult legend among fans of Americana and progressive Texas country," writes Russell Brabham. "Blending folk, country, and pop with witty, introspective lyrics, Ramsey recorded a critically acclaimed debut album for Leon Russell's Shelter label in 1972. It was one of the first albums by the new school of Austin singer/songwriters that would come to be tagged "progressive country" (Guy Clark and Townes Van Zandt among them). However, Ramsey subsequently disappeared from music, owing to conflicts with his label and a general distaste for the business." But he's back. " I was seeing him in little clubs when I was at SMU in 1970-1973. Can't wait to see him in this pristine format," adds Brabham. Featuring seasoned young performers Christian Dantes and Meagan Crews and a back-up gang of additionally capable teens and Daniel Ley's rock orchestra, the Academy of Childrens Theater production of Grease will entertain buckily. June 5th-7th, 7 p.m. and June 8th @ 2p.m. Tickets: $25 and $20. Lighten up when you check out the internationally-known artist Wayne White. His gigantic cardboard-based sculptures, the droll words he has painted upon thrift-store framed paintings: none of it is sacred to the man from Los Angeles who has kept his accent from the days when he was from Chattanooga. He won fame in the 80's with design for the TV show Pee Wee's Playhouse, plus direction for a couple of seminal music videos. Since then his droll attitude has carried him to the top of the marquee in terms of name artists. Party with the big name but aw, shucks artist on Fri, June 6, 6 pm to 9 pm, at Artspace Shreveport. Music by the estimable singer AJ Haynes and her group, The Seratones. $10 Admission /$5 with Military ID. Cash bar. Mr White is returning in July with animated gigantiples. See his mega puppets in a Shreveport Common parade at UnScene on Saturday, July 12. Shreveport’s new summertime Open-Air Market begins June 6th and goes through August 8th; it's every Friday evening for 10 weeks, says Julia Foley. Mall St. Vincent will host the South Highlands Summer Market from 5:00 to 9:00 pm under a large tent outside the mall adjacent to the historic St. Vincent Academy. - among the first vendors: Sacred Strawberry, Wired & Sassy, Artisan Jewelry, Toomasuba, Bee Goods, Pa Honey Candy Company, Stewart's Produce, Pa Chang's, Sweet Tee's and Gogreenly (vegetarian dishes). Sweet Tees is a merch idea that has been brewing in the minds of Kathy May Ross and daughter Lauren Ross for several years. They've begun their "gourmet T shirt" enterprise with a couple of cultural grabs that are wittily local: Thrill Hill and Betty Virginia Park, as in the lost rocket structure. With designers Paul McCallister and Todd Miller at Popular Creative they have created a subtle series of shirts. Says Lauren, "These tee shirts are American Apparel vintage feel fitted tees. The designs pay homage to past and current Shreveport landmarks." They are aimed at the upscale market, priced at $28 - 32. Adds Ross, "Sweet Tees are locally designed and printed here in our area. We pride ourselves in using all local vendors to create and promote these shirts." "These shirts tap into and embody the recent surge of pride in Shreveport's history and optimism for its future. I could not be a bigger fan of Sweet Tees and what it says about the fresh energy and changing winds in Shreveport-Bossier," says Thomas Avallone. A recent customer responded, "My grandfather sold the rocket to Betty Virginia in the 60s during the "space age". We always thought that was the coolest thing to play on, and now I can think back and remember my grandfather every time I put this shirt on, which is priceless to me! Thanks sweet tee Shreveport for such a special memory!!" Ross says that orders can be placed at sweetteesport@gmail.com. Adds Ross, "We deliver to home or office. We also ship in and out of state to anyone needing a piece of Shreve!" See them face to face at the South Highlands Summer Market, Fri, June 6, 5 pm, at Mall St Vincent. "PACE is grilling in Betty Virginia Park. Everyone is welcome," says Adrienne Critcher, "PACE will be providing the food and drinks; all you need to bring is you, your friends and your family." Costumes of elegance and whimsy, choreography suited to each group of dancers and a dance corps that spans kindergarten through high school; Louisiana Dance Theater proved its vibrance as a center for elegant movement with its concert on Sat, May 31, at the Strand Theater, Shreveport. Carol Anglin and Dianne Maroney-Grigsby and their hard-working team of dancer wranglers produced a show that was well-attended and quickly paced. In addition to steps by choreographers from across the US (Jon Lehrer, for ex.) , the lighting was engineered by a veteran European designer, Pavel Perebillo. Enjoy a photo album here.